A sudden increase of typhoid fever was reported last month in several areas around Malaysia, Sabah1. Kinabatangan recorded one case while another eight cases were reported in Tawau with one death, which is yet to confirm the actual cause of death2. All cases were identified as sporadic and currently there was still no evidence to suggest an outbreak in Sabah3. State Health Department is trying their best to monitor the situation and continuously carried out health awareness campaigns to educate the public on food cleanliness and hygiene1. Typhoid fever, which is also known as “Demam Kepialu” in Malay, is spread by contaminated food and water4. Wide spectrum of symptoms including lasting high fever, headache, stomach pain, constipation, internal bleeding and even death4. Symptoms may also resemble other diseases such as malaria, typhus and various viral infections5. Typhoid fever affects more than 21 million people annually. 17.8 million cases of typhoid fever were estimated to occur each year in low-and middle-income countries6 with almost 200,000 related deaths reported worldwide5. India, Pakistan, and Egypt are also known as high-risk areas for developing this disease. Early and reliable diagnosis of typhoid fever is crucial to accurately determine the right treatment for patients with typhoid-like symptoms. 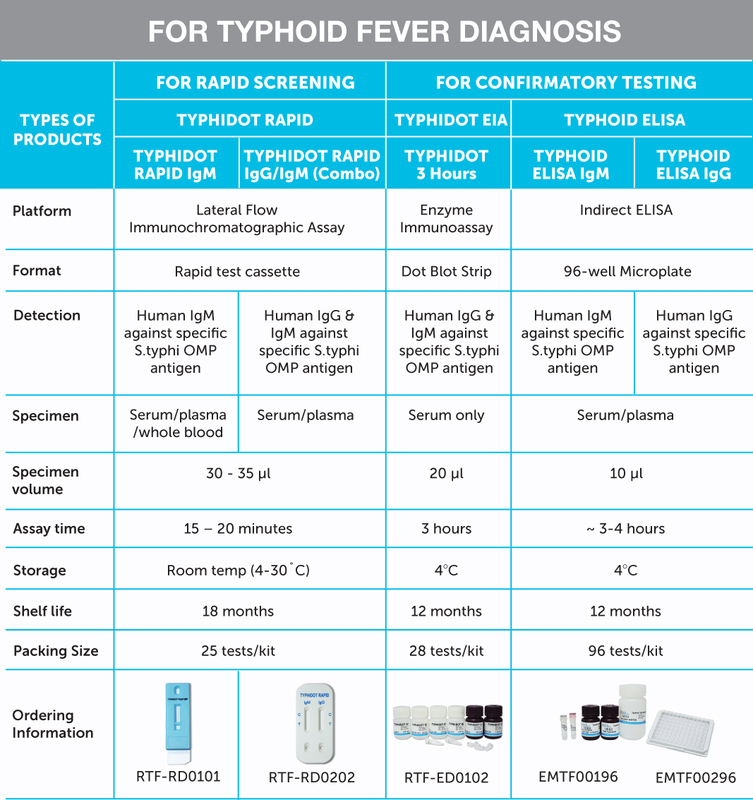 Reszon Diagnostics (Reszon) is committed in providing a wide range of diagnostic tools for detection of typhoid fever, from screening to confirmatory testing.